Call 843-747-0385 for Custom Exhaust Services! Do you have to constantly turn up your car radio in order to hear the tunes due to a loud engine? Do your neighbors complain that they can hear you coming a mile away? It’s time to get your muffler replaced. In the greater Charleston, SC area, there’s no better place for muffler repair service than The Muffler Shop! The Muffler Shop is a muffler repair shop that serves Charleston, SC and the surrounding areas . We provide our customers with quality hometown custom exhaust service at a reasonable price. For more than 20 years we have been providing excellent service and customer relations. We service all foreign and domestic models and offer free estimates for all vehicles. When your car needs a new muffler, the only name you need to remember is The Muffler Shop! A muffler is one of the most important parts in helping keep the noise that your car makes at a reasonable level. Even though the inside of automobile mufflers looks like just a simple set of tubes, it is a finely tuned instrument specifically designed to keep down the noise level of your car. By reflecting the sound waves produced by the engine, your muffler effectively cancels out the noise for a smooth, quiet ride. When your car needs a new muffler, call The Muffler Shop in Charleston, SC! Here at The Muffler Shop, it is our job to keep that loud noise to a minimum with a new muffler. With more than 25 years of combined experience, our certified professional technicians provide quick and dependable work to get your car back on the road as soon as possible, without the neighbors being able to hear you from blocks away. Stop by for a free muffler inspection with no obligation or hassles. We will diagnose the problem and give you the best and most affordable solution. Quality Muffler Repair Service for Drivers in Charleston, SC! We are proud to be a small business that serves the local community. By getting your new muffler or catalytic converter at The Muffler Shop, you are not only helping your car, you are also helping your local economy. Our rates are competitive, and we provide the best customer service in the Charleston, SC area. When your car is screaming down the highway, it should be in your best interest to have it brought in for a muffler repair service sooner rather than later. 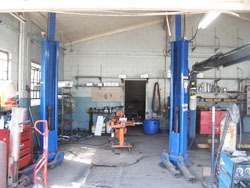 Not only can we provide muffler repair services, but also a number of different auto repair services. This includes anything from brakes to air conditioning, 4-wheel computerized alignments to oil changes. Call our shop today to learn more about our services in the Charleston, SC area. If you are not sure whether or not you need a new muffler, or if you have questions about your catalytic converter, just come see our experts at The Muffler Shop. We're always eager and happy to help. The Muffler Shop delivers professional and reliable muffler repair service at an affordable cost to each and every one of our customers. When you are out on the road, you should feel safe. 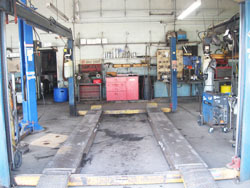 At The Muffler Shop, we strive to make sure that your drive is always worry-free. At The Muffler Shop, we know how inconvenient being without your vehicle can be while it is in the shop having work completed. We promise to have each job done in a timely manner, and work diligently to keep this promise in our effort to save you time, energy, and frustration. When you need new automobile mufflers or other repairs done on your vehicle, don't try them yourself. 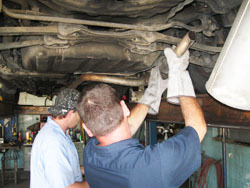 Let the experts at The Muffler Shop take care of all your catalytic converter and muffler maintenance needs. We pride ourselves on performing a full range of services and repairs on your car. We'll treat you with honesty and respect, and we pride ourselves on getting things right the first time. Whether you need a new muffler or a custom exhaust system for your car or truck, we can get the job done quickly at an affordable rate. The Muffler Shop is a muffler repair shop that serves drivers throughout the greater Charleston, SC area. For everything from a new muffler or catalytic converter to custom exhaust service, The Muffler Shop has you and your vehicle covered. Give us a call today at 843-747-0385. We look forward to meeting you and providing the best possible service for your vehicle! If you've ever heard a car engine running without a muffler, you know what a huge difference a muffler can make to the noise level. Inside a muffler, you'll find a deceptively simple set of tubes with some holes in them. These tubes and chambers are actually as finely tuned as a musical instrument. They are designed to reflect the sound waves produced by the engine in such a way that they partially cancel themselves out. Here at The Muffler Shop, it is our job to keep that loud noise to a minimum. With over 25 yrs of experience, our certified professional technicians provide quick and dependable work to get you back on the road as soon as possible. Stop by for a free inspection with no obligation or hassles. We will diagnose the problem and give you the best most affordable solution. 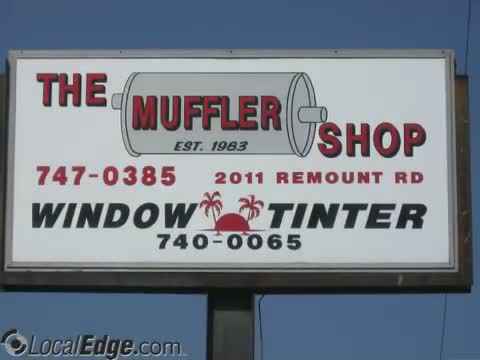 The Muffler Shop, we are The Shop when you need a Muffler. "Our work is exhausting."